Spices are a great way to enhance flavour in your food. I recently visited New York City and had the opportunity to go to the Chelsea Market. I was so thrilled to come across this amazing spice store in the market. I mean…. only in NYC would there be a store completely dedicated to spices!! Heaven really is a place on earth. 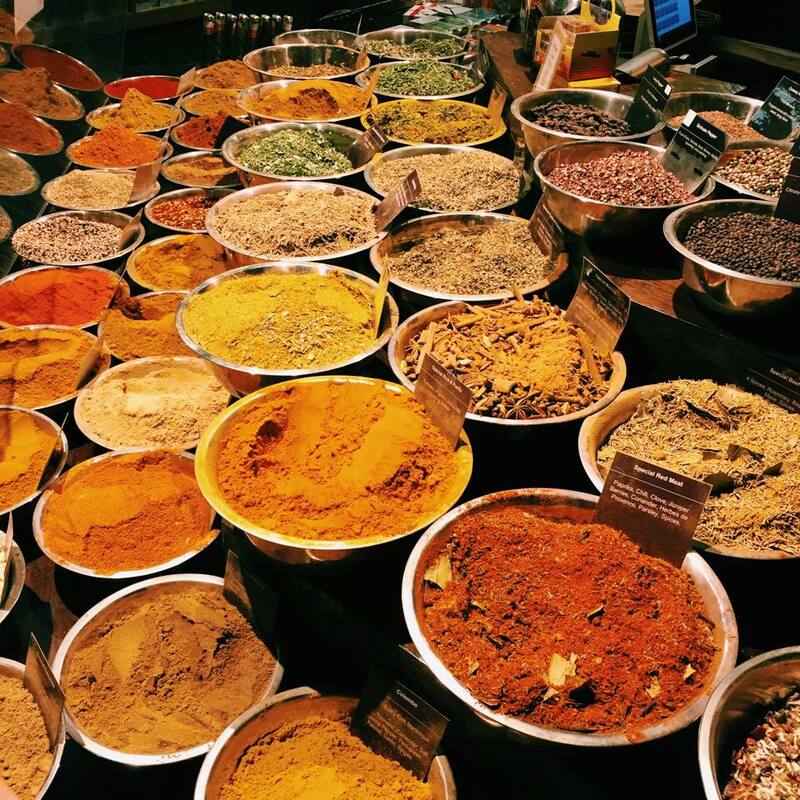 This is a photo I took walking through the Spice store…. seriously could these spices be any more photogenic?!! Ginger: Contains Gingerol, which is a relative of capsaicin found in chili peppers. This gives ginger it’s bite of spicy and may help boost your metabolism. Ginger in the past was used to treat many different gastrointestinal discomforts by soothing the digestive tract and aids in de-bloating your stomach. Ginger also plays a role in preventing motion sickness and nausea. Additionally, it may have a role as an anti-inflammatory. — Ginger is great to add to your stir frys and can even be added to smoothies. Tumeric: Tumeric works as an antioxidant as it increases levels of GSH (glutathione). GSH is very important to liver function and keeping the body at equilibrium. Additionally, this antioxidant plays a role in wound healing and also contains anti-inflammatory properties. Cinnamon: Cinnamon is well known to boost satiety (feelings of fullness) and mimic sweetness. Cinnamon also boasts high antioxidant activity therefore, may have a role in preventing different illnesses (e.g. certain cancers). — Try sprinkling cinnamon on apples, in oatmeal, and add it to baked good recipes. Cayenne: Cayenne pepper is known for its heat production therefore, plays a great role in boosting metabolism. Cayenne is also known for its anti-inflammatory effects on the body, Vitamin A content, and preventing congestion/mucus build up in the body. Additionally, cayenne’s heat producing effects help to stimulate the release of buffering juices from the stomach lining to aid in the prevention of ulcer formation. Wow look at all the amazing colors! Looks so tempting to give them all a taste!